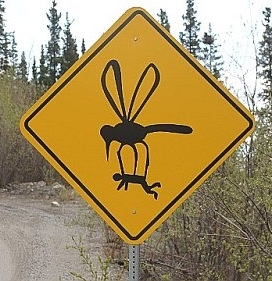 Warm summer weather - and mosquitoes - are just around the corner in much of the U.S. Many areas have recently experienced flooding that may bring bumper crops of the pesky pests. And disease cases from mosquito, flea and tick bites more than tripled in the US from 2001 to 2016. Here are some tips from NIOSH to help keep outdoor workers safe from mosquito-borne illnesses. Employers should protect workers and workers should protect themselves from diseases spread by mosquitoes. Although most people do not become sick after a bite from an infected mosquito, some people have a mild, short-term illness or (rarely) severe or long-term illness. Severe cases of mosquito-borne diseases can cause death. Diseases that are spread to people by mosquitoes include Zika virus, West Nile virus, Chikungunya virus, dengue and malaria. Workers at risk of being bitten by mosquitoes are those who spend time outdoors, including farmers, foresters, landscapers, groundskeepers, gardeners, painters, roofers, pavers, construction workers, laborers, mechanics, entomologists, wildlife biologists and field workers. Laboratory and clinical workers who handle infected fluids or tissues may also be at risk of infection. Transmission may occur through a break in their skin or via a sharp penetration injury. CDC information on the rise in insect-related illnesses.